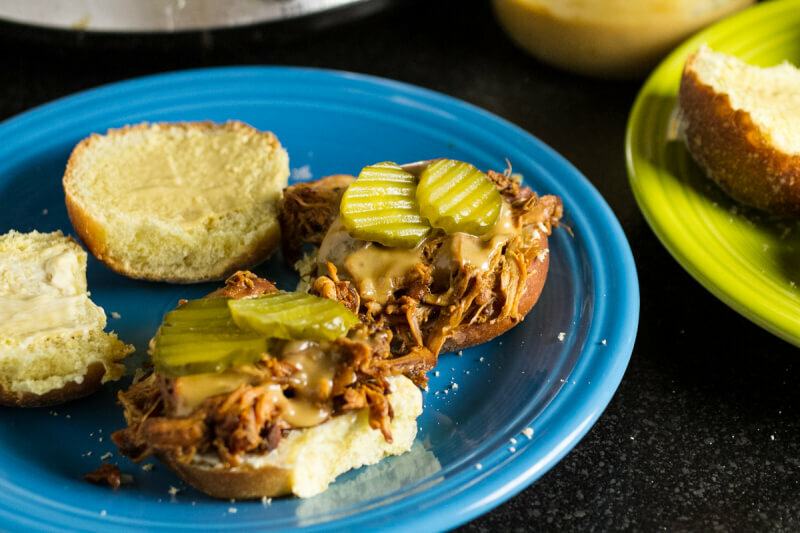 Instant Pot mojo pork is so easy to put together – just a few ingredients and it cooks up in just about an hour start to finish. It’s got amazing flavor and works well in so many applications! Scroll down for video! Have you ever been craving a food so much that you would go to just about any length to make it? We re-watched the movie Chef on Christmas Eve, and I have been wanting a Cuban sandwich ever since. There’s really no sandwich that compares to a Cuban…roasted pork, ham, swiss cheese, pickles, and mustard on Cuban bread. We went to Ceniza while I was on break but…I forgot that they don’t open until dinner time during the week. 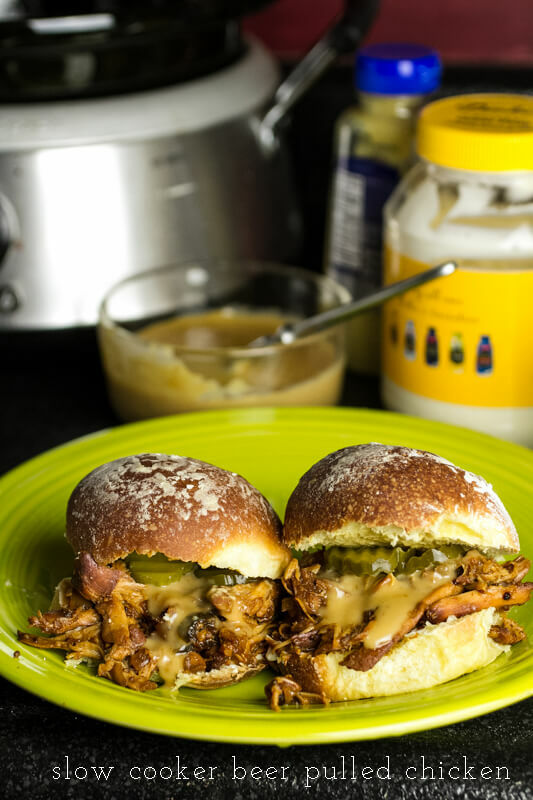 Save Time By Making Mojo Pork in the Instant Pot! So, I had to resort to my own resources. I had watched a Binging with Babish video where he made a perfectly roasted mojo pork shoulder that he marinated with about a million ingredients then rubbed with a million more. Looked amazing but that’s a few too many ingredients for me. This Instant Pot mojo pork is a little more my style. Just a few ingredients that I can throw together in about ten minutes and cook in about an hour, start to finish. I don’t claim that this is an authentic recipe but it does have amazing mojo flavors: garlic, citrus, and pork shoulders. 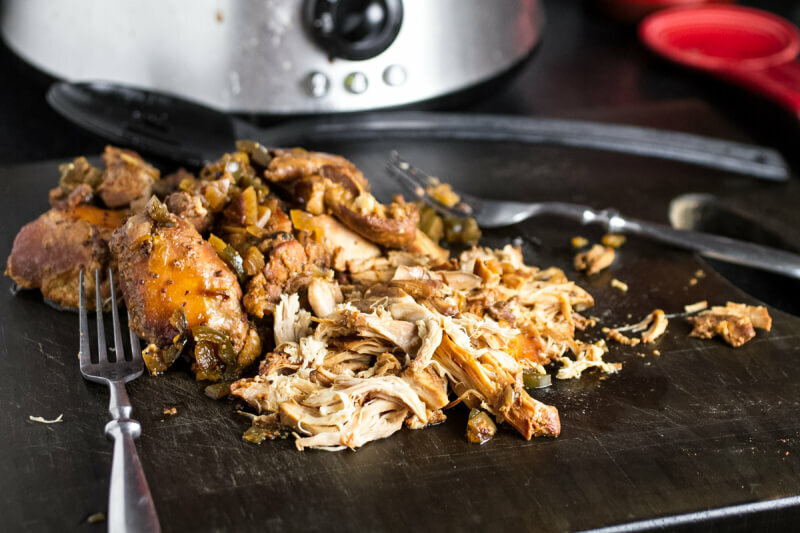 Instant Pot mojo pork is perfect for Cuban sandwiches but it’s also great for tacos, burritos, or just as the meat mean dish on your plate. Warning: there are 8 cloves of garlic in this and your Instant Pot sealing ring is going to be super-stinky. Store the lid upside down or separate from the pot to minimize the stink! Don’t miss a Chattavore video! Click here to subscribe to my YouTube channel. Salt and pepper both sides of the pork pieces. Place the pork in the Instant Pot. Whisk together the orange juice, lime juice, garlic, oregano, and cumin. Pour over the meat in the Instant Pot. Place the lid on the Instant Pot and set the vent to sealing. Select the manual or pressure setting and set the time to 25 minutes. When the cook time on the Instant Pot is up, press the "cancel" button to turn the Instant Pot off. Allow the Instant Pot to depressurize naturally. When the float valve drops, remove the lid and use tongs to remove the meat from the Instant Pot to a cutting board. 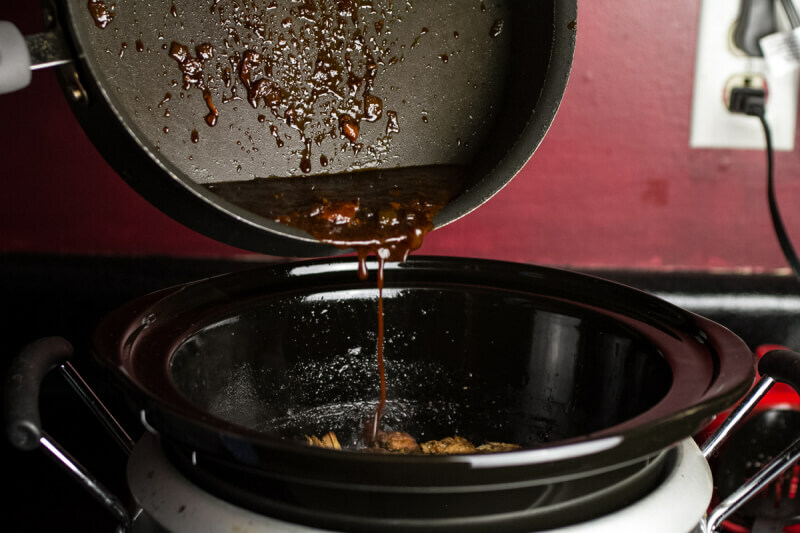 Turn the Instant Pot to sauté and allow the liquid to reduce while you shred the meat. Place the meat in a bowl and pour the reduced liquid over the meat. Serve as desired. Cook time includes the time to allow the Instant Pot to come to pressure and depressurize naturally. It may take slightly more or less time depending on the temperature of your ingredients, altitude, etc. This recipe can also be made in the slow cooker - just place the meat and the sauce ingredients in your slow cooker and cook on low for 8-10 hours, until tender. These Instant Pot pork tinga tacos are easy and so tasty! The Instant Pot does most of the work so you can get something else done while it cooks! By now I am fairly certain that my love for my Instant Pot (affiliate link) is pretty well known. I use it at least once a week, usually more, and have since I got it almost a year and a half ago. I have read a couple of reviews over the last week from fellow bloggers who decided that the Instant Pot is not for them (one from 100 Days of Real Food and one from The Country Contessa). While I certainly respect their opinions and think that everyone should make their own decisions about whether they want to own an Instant Pot or other electric pressure cooker, I wanted to share my thoughts about why I love my Instant Pot so much. First off, the reason that I bought the Instant Pot: it does a million different things. Okay, seven, but who’s counting? It’s a pressure cooker, slow cooker, sauté pot, steamer, rice cooker, yogurt maker, and warmer. I actually held on to my slow cooker for a year after I got my Instant Pot (which was in November 2015) but only used it once or twice during that time, so I recently donated it. It turns out I loved my Instant Pot way more than I did my slow cooker. Why is that? Well, because I am the kind of person who really, really hates trying to get my slow cooker ready to go before I leave in the morning. Philip goes in to work quite a bit later than me, so he could do it, but then I’d have to write directions down and that’s really no better than having to get the slow cooker ready in the morning. With the Instant Pot, I can get everything ready after I get home, then I can do whatever I need to do – yoga, making my lunch, working on the blog – while the Instant Pot does the work for me. I don’t have to worry about the Instant Pot overcooking my meat, which was definitely an issue with the slow cooker, at least with chicken, which always seemed to dry out even when it clicked to “warm” at the end of the cook cycle. I’ve discovered that I really, really love to make pasta in my Instant Pot. I can put the pasta in with the meat and some liquid, put it under pressure, and let it go. The pasta absorbs the liquid, no need for draining. Yes, I could do this on the stovetop…but then I’d be watching it, checking it, stirring it. With the Instant Pot I just. let. it. go. Another thing? This is going to sound silly, you guys. It makes me so much more likely to cook rice as a side dish or base for a bowl meal or whatever. Because apparently cooking rice on the stovetop or in the oven was just more than I could handle? I don’t know what my deal was, I really don’t. But with the Instant Pot, I just put in rice and then double the amount of liquid to rice, sprinkle a little salt, and lid up. The thing is, you have to know what you’re getting in to. Maybe the name “Instant Pot” is a little misleading. No, it isn’t “instant”. Pressure cookers just aren’t. They take time to come to pressure and more time to release pressure (unless you do quick release, which you do with many recipes). However, the time under pressure is much shorter than a slow cooker, oven, or stovetop cook time, and again, I get a lot done while my food is under pressure. Another thing? If you’re cooking a big hunk of meat, you need to cut it into several pieces. Otherwise it will be tough…but if you cut it up before cooking it will be perfect. Finally, you will have some flops. I tried to make cheesy cauliflower rice at least four different ways and every time my rice was so mushy. That’s the thing, though…with any specialty appliance you are going to have some hits and some misses. I highly recommend that if you get an Instant Pot that you get a good pressure cooker cookbook to help you understand the ins and outs of pressure cooking. I bought Pressure Cooker Perfection from America’s Test Kitchen (affiliate link) and it has been so helpful. I check it to see if a cut of meat should be quick release or natural release, how long things should cook, etc. It took a lot of the guesswork out of pressure cooking and is a lot more specific than a lot of blogs are. 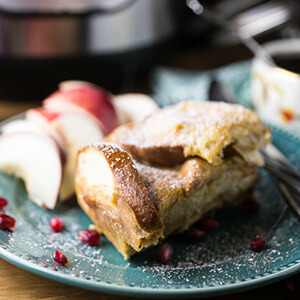 I promise I will always try to give explicit pressure cooking directions (and I always try to include slow cooker directions for those of you who don’t have an Instant Pot!). This week I have Instant Pot Pork Tinga tacos. 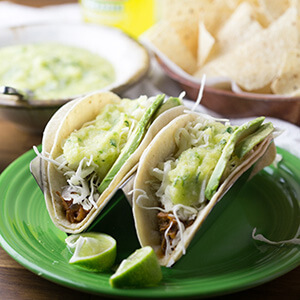 Speaking of America’s Test Kitchen, this recipe is adapted from a recipe for pork tinga tostadas from The Cook’s Illustrated Meat Book (affiliate link). Instant Pot pork tinga was a great way for me to use up the gigantic pork shoulder that we got from Costco a few months ago. The pork shoulder was the largest cut of meat we’ve ever purchased and we have gotten at least fifteen meals from it – I am not joking. Five of them were from this recipe alone! 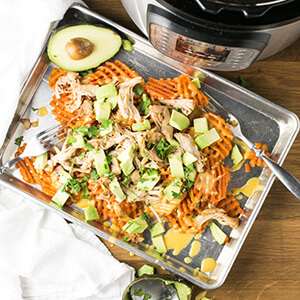 Instant Pot pork tinga was extremely easy to throw together and it made amazing leftovers (many of which I froze). The meat paired perfectly with a quick pineapple salsa I whizzed up in my food processor! For a delicious and simple Instant Pot meal, try these Instant Pot pork tinga tacos! This recipe contains affiliate links. This means that if you click the link and make a purchase, I will receive a small commission. This does not affect the cost to you. For more information, please see my disclosures. Thank you so much for supporting my blog! This recipe is adapted from The Cook's Illustrated Meat Book. Place the pork, quartered onion, smashed garlic, dried thyme, 1 teaspoon salt, and 6 cups of water into the Instant Pot. Cover, make sure the vent is set to "sealing", and select "manual". Set the time for 30 minutes. After the Instant Pot has finished cooking, allow it to depressurize naturally. Drain the meat, reserving 1 cup of the cooking liquid. Remove the onions and garlic and discard. Place the meat on a cutting board or in a large bowl and use a potato masher to mash the meat into smaller pieces. Wipe the Instant Pot out and add the olive oil. Set to "sauté", increase the heat to "high", and heat until the oil is shimmering. Add the pork, chopped onion, and oregano and cook, stirring constantly, until the pork is browned (7-10 minutes). Add the tomato sauce, bay leaves, and pork cooking liquid. Cook until most of the liquid has evaporated, about 5 minutes. Remove the bay leaves, season with salt to taste, and serve immediately with corn or flour tortillas and desired toppings. Don't let the long cook time on this recipe scare you. Most of the cooking is hands off. To prepare this recipe in a slow cooker, place the pork, onions, garlic, thyme, salt, and water in the slow cooker and cook on low for 8 hours. Follow remaining directions, completing the steps done in the Instant Pot on the sauté function in a large skillet or Dutch oven.